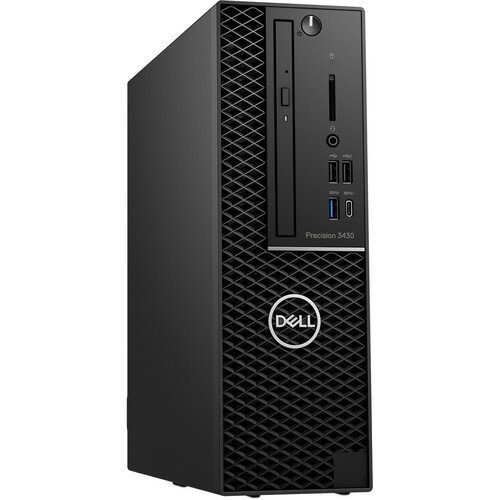 Built to deliver professional performance while maintaining a compact footprint, the Precision 3430 Small Form Factor Workstation from Dell is a fully configurable and ISV-certified system. This system is powered by a 3.3 GHz Intel Xeon E-2124 Quad-Core processor, which will allow you to run multiple applications simultaneously. The 16GB of 2666 MHz DDR4 RAM helps to ensure smooth multitasking and also allows the computer to quickly access frequently used files and programs. While the current memory configuration is 2 x 8GB, there are four 288-pin DIMM memory slots that will allow the RAM to be upgraded to 64GB, using one 16GB module in each of the four memory slots. For storage of your files, a 256GB NVMe PCIe M.2 SSD offers quick access to your data. If you want to add external storage drives or other peripherals, the Precision 3420 features one 10 Gb/s USB 3.1 Gen 2 Type-C port, five 5 Gb/s USB 3.1 Gen 1 Type-A ports (1 front, 4 rear), four USB 2.0 Type-A ports (2 front, 2 rear), and two PS/2 ports. The dedicated NVIDIA Quadro P1000 graphics card has 4GB of GDDR5 video memory and delivers a sharp, clear picture at resolutions up to 5120 x 2880 @ 60 Hz. It can support up to four simultaneous displays using its four mini DisplayPort 1.4 outputs. Whether you are listening to music, watching a movie, or playing a game, the integrated Realtek HD ALC3234 audio codec outputs high-definition audio and delivers higher fidelity than standard audio controllers. Other integrated features include an 8x DVD±RW drive, an SD card reader, and Gigabit Ethernet. The Precision 3430 Small Form Factor Workstation includes Dell's KB216 USB keyboard, MS116 USB mouse, four mini DisplayPort to DisplayPort adapters, and a power cord. It operates using a 260W 92% efficient power supply that is compatible with 100-240 VAC at 50-60 Hz. The installed operating system is Windows 10 Pro for Workstations (64-bit). Get power without sacrificing your budget on Dell Precision 3000 Series Workstations. Elevate your ideas with professional performance, a compact industrial design, and Dell's Reliable Memory Technology. Your Precision 3430 Small Form Factor features an industrial small form factor design for space-constrained workspaces that need workstation-class performance and reliability. Handle demanding tasks with ease thanks to a range of features designed for an efficient workflow. Premium materials and the optional external dust filter help keep internal components clean, while Wi-Fi capabilities and a range of accessible ports keep you connected to everything you need. Power through intensive tasks thanks to a 3.3 GHz Intel Xeon E-2124 Quad-Core processor and 16GB of 2666 MHz DDR4 memory, which can be upgraded to 64GB. Run professional applications faster with compatibility for AMD Radeon Pro and NVIDIA Quadro professional graphics with up to 55W of graphics support. Scalable storage featuring SATA, SAS, and PCIe NVMe SSD options up to 6TB delivers improved performance for complex projects. Plus, Intel Optane Memory further boosts your system's responsiveness while keeping high capacity storage costs to a minimum. When there's no margin for error, Dell Reliable Memory Technology (RMT) Pro protects your work from potential crashes. Dell's RMT Pro works in conjunction with ECC memory to detect and correct memory errors in real time. Precision Workstations are tested to ensure that high-performance applications you rely on every day run smoothly. Dell ISV certifications cover popular independent software applications. A complete list is available on Dell's website. Free with your Precision workstation, the Dell Precision Optimizer delivers faster application optimization with a single click. It also automatically tunes your workstation to run popular ISV applications at the fast speeds, has automated system updates, and provides analytics to address resource bottlenecks. Upgrade to the premium version of Dell Precision Optimizer. This AI-based performance optimizer software for workstations learns the behavior of user-specified applications, identifies optimization opportunities using machine learning, and applies performance improvements. With Dell Data Guardian, you can protect your data regardless of how it is used, shared, or stored throughout your ecosystem. Data security that pairs and stays with the data allows you to collaborate and share your content in unique ways. Experience a manageable line of commercial systems featuring the free Dell Client Command Suite toolkit for flexible and automated BIOS and system configurations. The optional vPro extension allows for out-of-band systems management. Dell commercial systems have a low reported failure rate. They are tested to ensure the high-performance applications you rely on every day run smoothly.